Would you like to start a cement business in Nigeria? Are you interested in buying and selling cement products? Are you aspiring to be a distributor for major cement producers in Nigeria? How do I become a Dangote cement distributor? What is the profit in cement distribution in Nigeria? So before we go any further, let me answer the questions mentioned above. Fact 1. There is a high demand for cement products in Nigeria as there is consistent construction going on in every hook and cranny of the nation. So where there is a need to build a family house, hospital, school, church, mosque, hotel, road, bridge, market place – there is need for cement. Hence starting a cement business in Nigeria will most definitely give you good returns on your investment. Fact 2. Dangote Cement is undeniably the largest and most popular largest cement producer in West Africa and Nigeria. Their cement is a household name to construction companies’ weather big or small. In fact some contractors will not enter into an agreement with you if the construction will not be done with Dangote cement. You can haul their cement products from one location to the other. For you to be able to do this, you must have a heavy duty truck and a driver. As soon as you have this in place, walk into any of their factories and tell them that you want to haul their cement to respective customers within a certain region. You will be pleasantly surprised at the frequency your services will be needed and the cash flow to your bank account. Here, you are not their distributing their products, you are providing a hauling service to Dangote. You can buy cement at wholesale rate from Dangote and retail to construction companies and other final consumers. Going into the buying and selling of cement is one for the most profitable investment avenues in the building materials industry in Nigeria, especially if you know how to go about it. Let me take a while to show you the possible profit you stand to make as a cement distributor. If you want to start buying from the Dangote, you will be purchasing each bag of cement at N2500 per bag. At this price you will be buying a trailer load of 600 bags. This will cost you N1, 500,000.00. 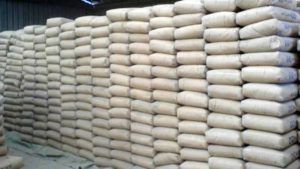 If you retail at N2600 for each cement bag, you will be making N1, 560,000.00 – that is a profit of N60,000.00 for each trailer load. So if you are supplying 1 trailer load of cement on 5 construction sites on a weekly basis, you will make N1.2 million in profit every month. You must register your business entity at the CAC Nigeria. This process is done to show the public that you are a credible business that is legalized to do business in Nigeria. To start the process, do to any of the Corporate Affairs Commission offices scattered across the nation to get registered. This process could take 2 – 4 weeks to get your company certificate. Pay your tax at when due. Will not avoid or evade tax. With these documents, walk into any bank of your choice with your company certificate, passport photography, identification card (international passport, driver’s license, etc.) to open a corporate account for your business. After you have opened a corporate bank account, fund it with the capital that you intend to start your cement distribution business with. Then get a reference letter from your bank. A bank reference letter is a letter from your bank that is stating that you have been their customer for a specific period of time. It also confirms that there is a banking relationship between you and them. Your certificate of company registration from Corporate Affairs Commission Nigeria. The capital you will need to start your cement distribution business. Know the specific advantages and disadvantages that are peculiar in your chosen location, avoid unnecessary pitfalls and mistakes. Plan out your operations in other to suit the available capital. As a distributor of cement, you will need a warehouse or cargo container where you will store your products before selling them to retailers or the final consumers. Your storage facility must be adequately protected from rainfall and excessive sunlight. This is because these elements will make the cement to cake hereby destroying the cement. I have seen a lot of people taking the risk of leaving their cement out in the open and covering them with tarpaulin. This is very bad and should not be encouraged because you stand the chance of having your goods destroyed or stolen. To effectively distribute your product, it is a good idea to buy a truck. This will allow you to efficiently deliver the cement to your customers. And you can even charge an extra fee to deliver at their door step. Look for clients to patronize your cement business. Go into construction sites and propose to supply cement to them. Find a unique selling point and take advantage of it. For example, I know that most cement distributors do not deliver on time. Therefore if you are known to deliver before deadline, you will be the talk of the town. Most contractors will want to use your services. Can I start a Cement Retailing Business in Nigeria? If you do not have the capital to start your cement distribution business in large scale, you can choose to become a retailer. By doing so, you will still make profit from this business. Now you will not need to go through the hassles of registering your company and all of that. Just walk into any cement producer’s factory of your choice and place order for a minimum of 600 bags. When the goods arrive in your shop, you can sell to customers at your own rate to make profit. You can even situate your shop in an area that is undergoing numerous building projects. There is money to be made in any level or scale of cement distribution you choose to start. Start today and cement your wealth for the future.